Lisa Armstrong has arrived at court in London this morning as she battles ex-husband Ant McPartlin for a share of his fortune. The 42-year-old, who is head of make-up for Strictly Come Dancing, is in line for around £30million – half of what presenter Ant earned during their 12-year marriage. The former couple were granted a decree nisi last month after announcing their split at the start of the year. 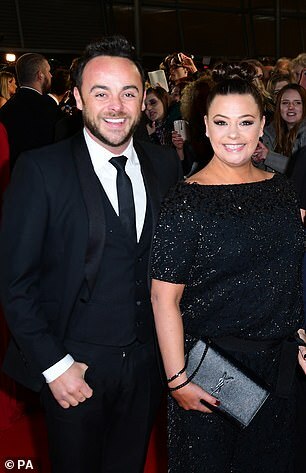 Since the break-up Ant, 42, has endured a turbulent year including being banned from the roads for drink-driving, but has also started a new relationship with his former PA Anne-Marie Corbett, also 42. The pair also share custody of their dog Hurley and it is understood who gets to keep the chocolate labrador will also be discussed. Ant is now in a relationship with the couple’s former PA Anne-Marie Corbett. Court documents revealed that McPartlin had ‘committed adultery’ with his new girlfriend Anne-Marie and that his former wife found it ‘intolerable to live with’ the TV star. He has since been seen out with Anne-Marie, who was the ex couple’s former PA, and has even made her the background on his mobile phone. According to the Mirror, the Saturday Night Takeaway star is paying Lisa’s legal bills and also funded her recent holiday to Los Angeles. A source told the website: ‘Ant is paying for all of Lisa’s legal fees. ‘He is still helping her financially with other expenses, like when she went on holiday to LA. There is no love lost between the former flames who were romantically together for 23 years. Lisa has not officially commented, but liked Twitter comments from friends telling her ‘good things come to kind people’ and ‘pull on your big girls pants, it’s your turn to start afresh’. Since learning of her former colleague’s relationship with her estranged husband, Lisa has revealed that she didn’t know the two were dating until she saw pictures of them together in a newspaper. In 2017, Ant entered rehab after struggling with a two-year addiction to super-strength painkillers following a knee operation in 2015. In April, three months after announcing his split from Lisa, he was banned from driving for 20 months and fined £86,000 for being more than twice the legal limit. After the incident and another rehab visit, Ant announced that he is stepping down from all his TV commitments and will not appear on the next series of I’m a Celebrity… Get Me Out of Here! It has since been revealed that Holly Willoughby will replace the presenter on the hit ITV Australian jungle series with his co-host Declan Donnelly later this year.